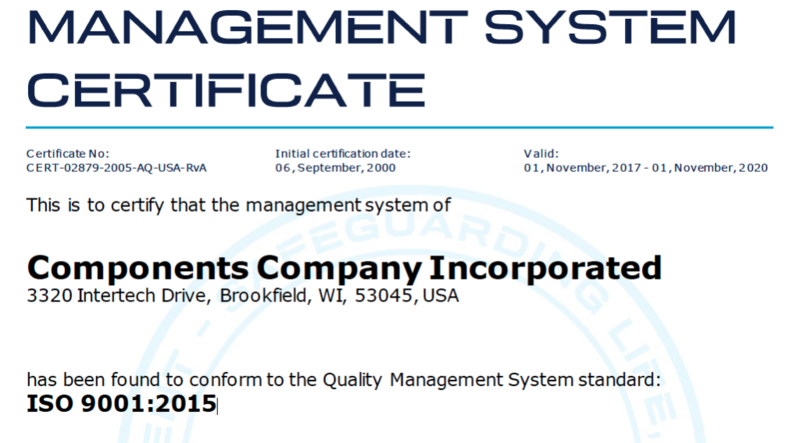 Components Company Inc. is happy to announce that we have once again completed a quality audit and have been found to conform to the ISO 9001:2015 Quality Management System standard. We received our first quality ISO certification in 2000. Since then, we have successfully completed many quality audits without nonconformities. Components Company takes our standards of quality seriously. We have an in-house quality department that is overseen by a full-time quality staff. The scorecards we receive from our customers are consistently 98% or higher. We implement customer specific inspection plans ranging from visual to dimensional, ISIR (Initial Sample Inspection Report) and PPAP (Production Part Approval Process). Learn more about our quality standards and view our ISO 9001:2015 quality certificate. You can also view a video about our quality. Contact us today and get started on the road to quality assurance!